It's school half term this week in our part of the country and I have thoroughly enjoyed not having to rush about in the mornings. It's going to be horrible next week when I have to try to persuade small daughter that she has to get out of bed in time to go to school, but I'll think about that when the time comes. In the meantime, I have made the most of getting up to feed the pets, making a cup of tea and then getting back into bed for half an hour or so to read a book, do a few rounds of knitting or check emails ... it's been bliss! I'm up and about early this morning as small daughter's friend is coming over to play and she's being dropped off on her Mum's way to work. I think she may even be arriving in her pyjamas as it's really very early for a holiday morning! We're planning to go to one of the kids' club morning showings at the local cinema so that should give me (and small daughter, who's not out of bed yet even though her friend's arrival is imminent) chance to snooze if the film isn't good! We've been to the pictures already once this week - we went to see Sing which we really enjoyed (I can be a bit cynical about films released in time for school holidays, they're not always as good as you want them to be) - and I decided after having spotted blog posts, Instagram and Facebook posts about people knitting at the pictures, that I would join their ranks and take my easy-knitting basic sock with me. 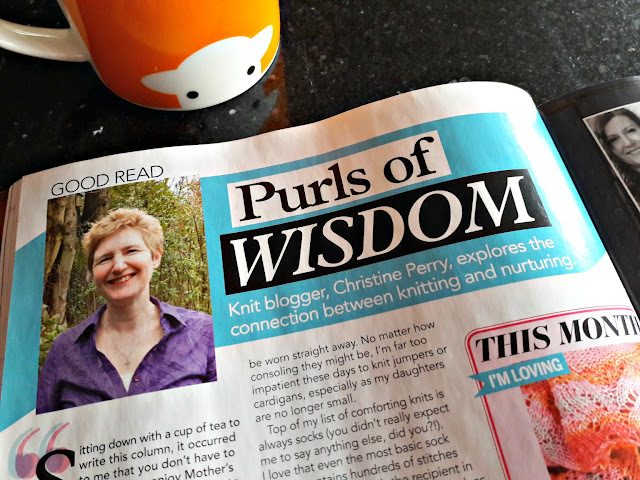 After all, I knit at home whilst I'm watching TV and there's no complicated pattern involved so I didn't need to look at what I was doing, did I? It turns out that I did. There was enough light during the adverts and the trailers for me to see what I was doing, but then the main film started and it went very dark. For a while, I was fine. 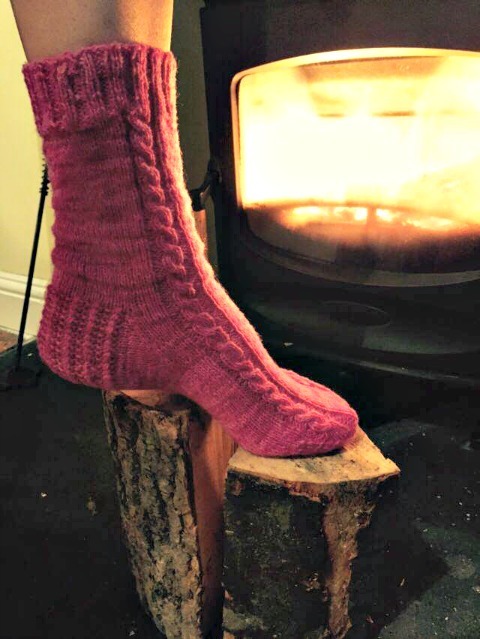 I've knitted socks for so long now that I often don't look at what I'm doing and I was very pleased with myself for having remembered to take my knitting with me. And then it happened ... I somehow managed to drop a stitch, it was a couple of rounds before I noticed and there was no way I was going to pick it up in the dark. My first thought was to get the torch out on my phone to try to fix the problem, and then almost in the same instant I decided that I would just put my knitting away. I'd gone to watch the film with small daughter and to spend time fiddling about with a torch wouldn't only disturb her but the people around us. 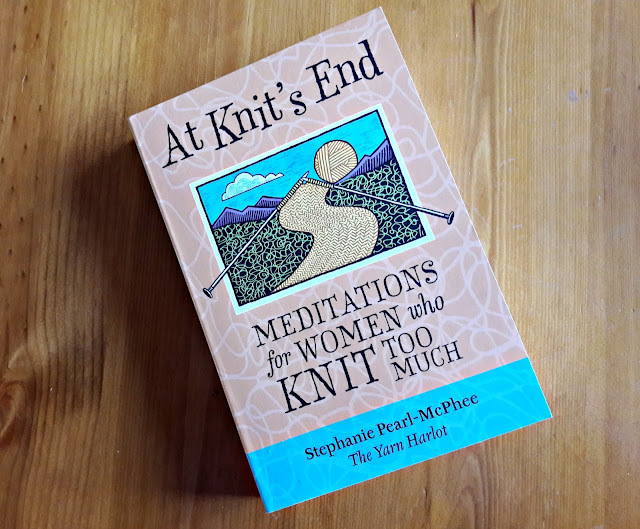 Sometimes, you just have to put the knitting down for a bit! I did get some of my sock done on the train on the way to Manchester on Wednesday, though. 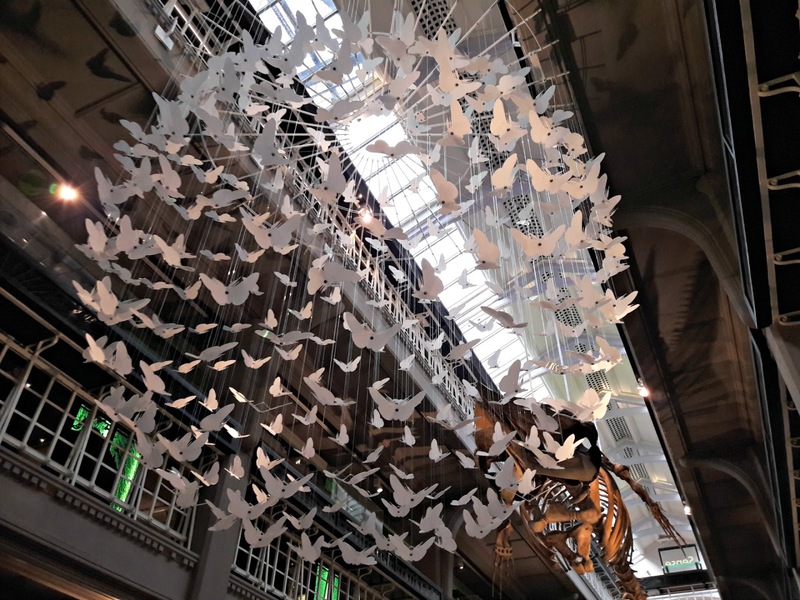 We decided to go to the Manchester Museum and then meet big daughter for lunch which, being a poor student (or so she tells us), big daughter was rather pleased about. 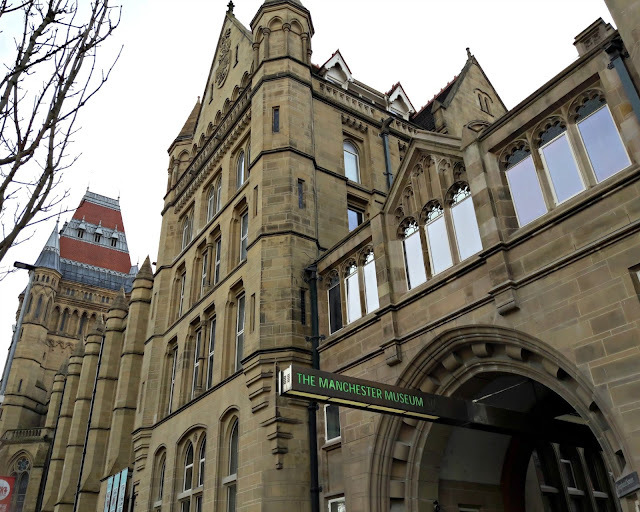 We've been to MOSI, the Museum of Science and Industry, many times but never the Manchester Museum which is actually part of the University of Manchester and houses collections that are linked to many of their courses. It's quite a long walk from the city centre down Oxford Road (luckily we met up with another family who were going the same way so we walked with them - I'd been about to head off in completely the wrong direction!) but it's worth the walk. The place was full when we got there so obviously lots of other people thought so too. It's free to get in so this makes it a good day out if you've got children (they do ask for donations and we were happy to make one as we enjoyed ourselves). It's a pretty imposing building and the museum itself is in two buildings connected by a link bridge. The main entrance is tucked away through that archway in a more modern part of the building. 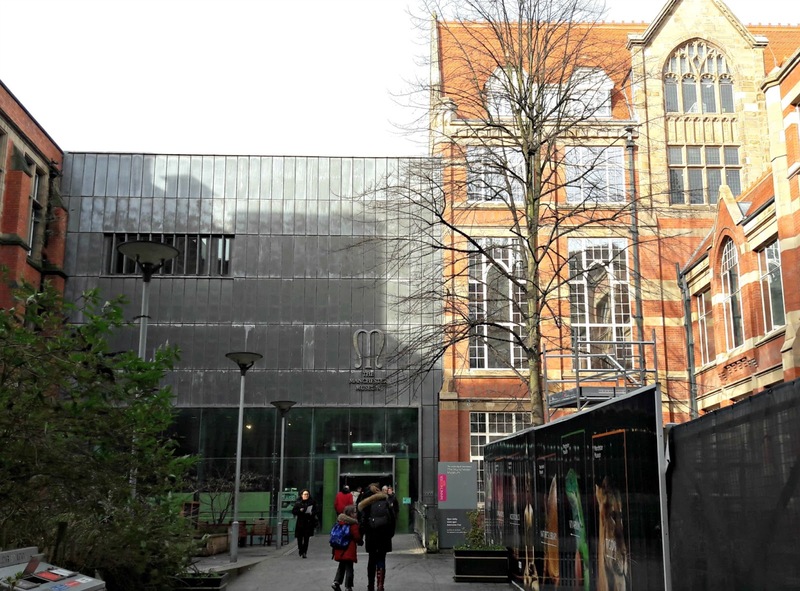 We might have missed it so if you do go, then you'll know to go inside the courtyard to find the main door! What I liked about this museum is that it was different to MOSI and also to the museums in Liverpool where we've been plenty of times. It's always good to see something new and although some of their collections looked familiar - Egyptians, archaeology, local history - they contained artefacts that we've never seen before. One of their Roman artefacts is a slave chain from 55BC around the time that Julius Caesar fought a battle against the British which is still in perfect working order. It made me smile that they've photographed one of the archaeology students wearing the chain - I bet the lecturers wish they could use it more often, especially on Monday mornings! The museum originated from the collection of John Leigh Phillips, who was a Manchester manufacturer and collector who died in 1814 and the collection has been added to ever since, even moving buildings as the collection outgrew it's existing space. 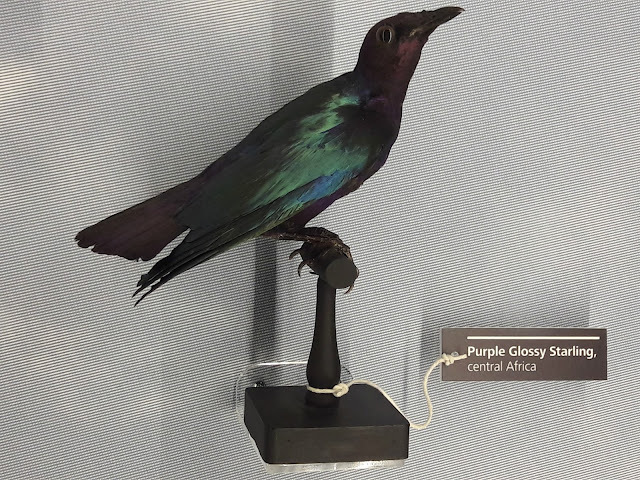 I would probably guess that the museum's Living Worlds collection's biggest growth period in artefacts might well have been in Victorian times as there are rather a lot of stuffed animals and birds and the Victorians did like their stuffed animals - a few too many for my taste, I have to say, although I thought that this Purple Glossy Starling was exceptionally pretty. Of course the camera doesn't do justice to the shiny feathers and I'm sure they would have been even more glossy on a living bird which I would never see as I don't go to central Africa on a regular basis, but I'm not keen on so much taxidermy in one place. Small daughter, on the other hand, was snapping away with her camera, rushing from one case to another in excitement - and she wasn't alone, there were lots of children doing the same - so it just goes to show that perhaps we do need to see collections like this from time to time. This skeleton was much more fun - we decided that it was probably some kind of dinosaur but managed to miss the label telling us what it was. 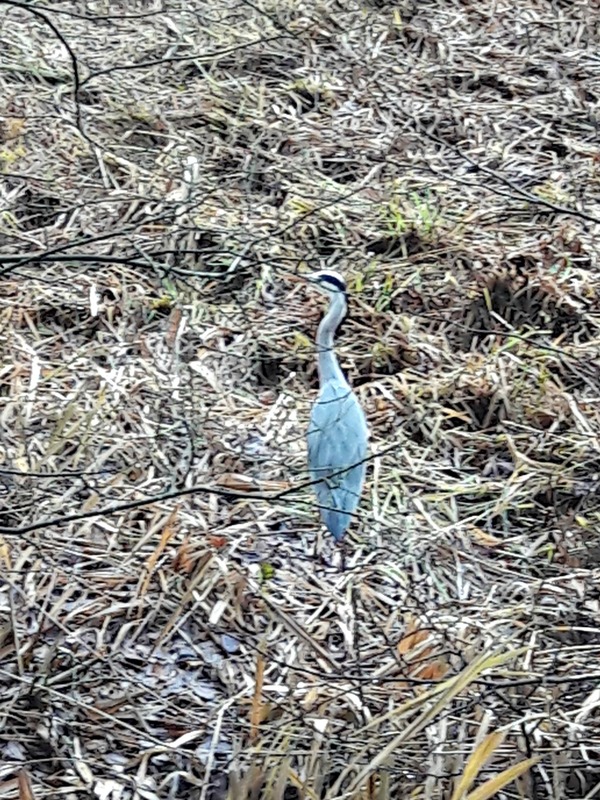 It was huge, I couldn't get it all into one picture from where we were standing but it had a long long tail and looked very fish-like. You wouldn't want to come across that when you were swimming. Look at those teeth! Now, because you will know if you've been reading this blog for any length of time that the researcher in me can't leave things alone without knowing all about them, I decided that I couldn't show you a picture of a dinosaur without telling you what it was. 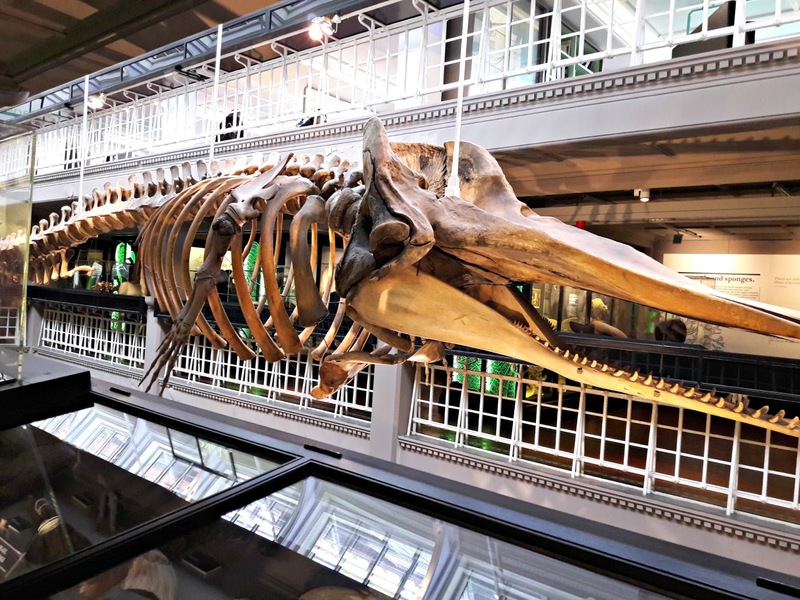 I phoned the museum to ask and a nice lady called Louise told me that it in fact, it isn't a dinosaur at all - it's a baby sperm whale. A baby! Imagine the size of an adult! Apparently it was about 6 years old (which is a baby in whale terms) when it beached and died in Massachusetts, it was bought by the museum and brought over to England and has been in that same spot in the museum ever since it arrived in 1898. I guess that's an immortality of sorts; not something that even a creature with the largest brain of any mammal would ever guess for itself though! Now aren't you glad I told you that? 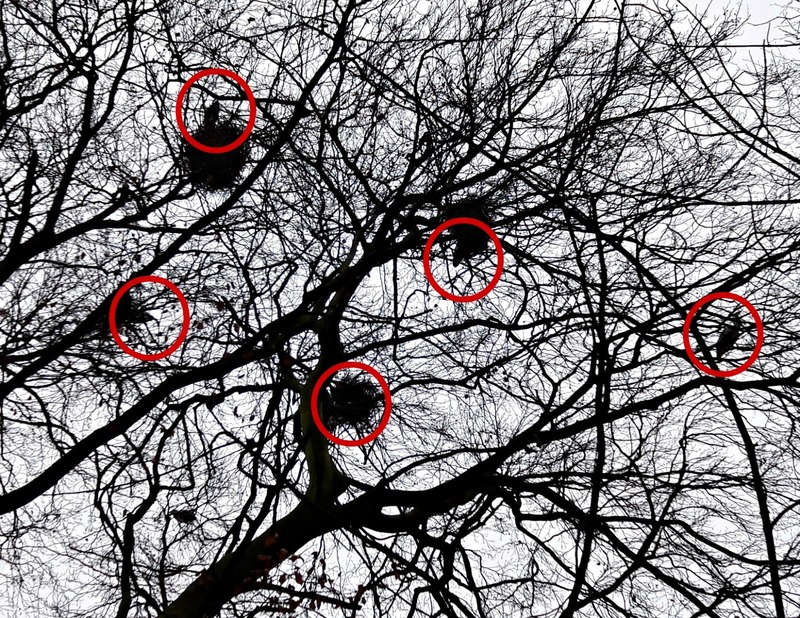 We could have been imagining that was some kind of dinosaur and we'd be completely wrong! I loved this installation of birds which hung like a huge ball from the ceiling. 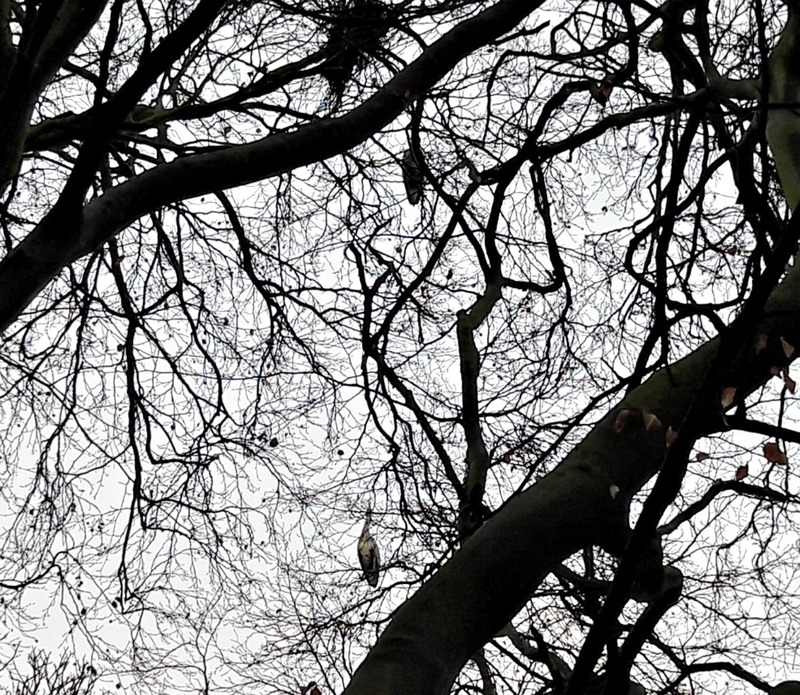 It reminded me of starling murmurations, even if the birds were the wrong colour! Despite the sheer number of artefacts, the museum doesn't feel cluttered and we didn't find that we couldn't get around even though it was busy. 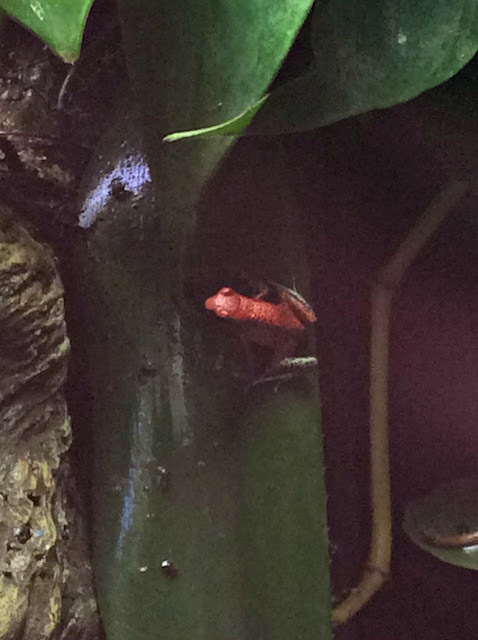 Up on the top floor is a vivarium with live reptiles and amphibians which is clearly very popular and for good reason - do you ever grow out the fun of spotting chameleons and tiny brightly coloured frogs amongst foliage? I don't think you do. 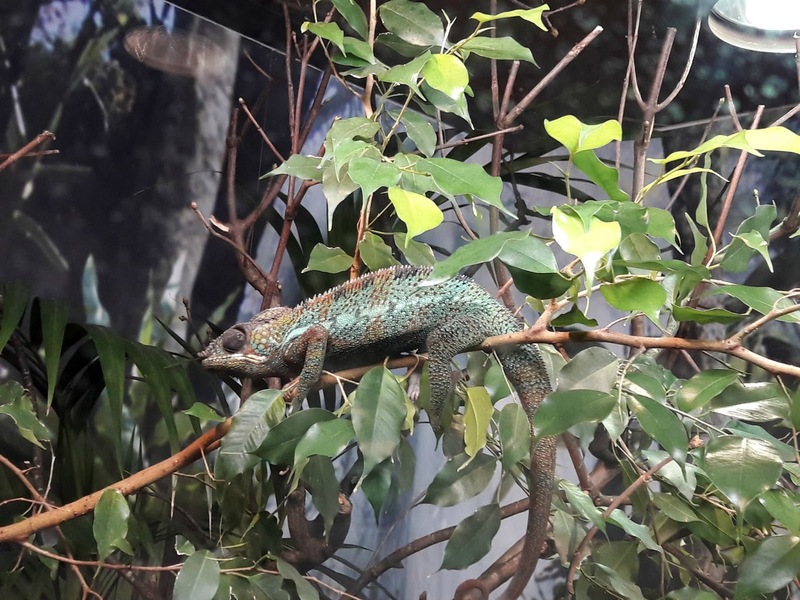 The Museum is involved in conservation programmes to help ensure that some of the rarest varieties don't become extinct due to loss of their natural habitat, and the vivarium is full of tanks of leaves and branches where these creatures can safely spend their days. 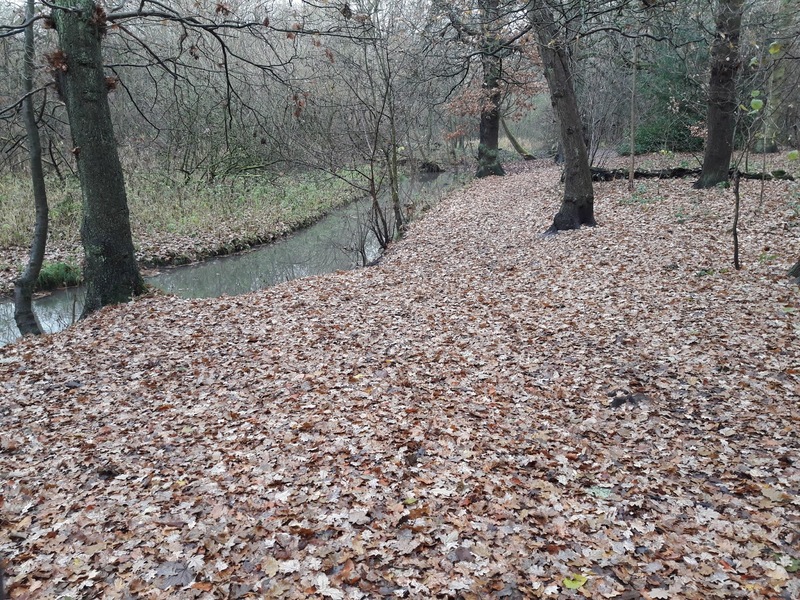 We would have spent a lot more of our day there too if we hadn't got a phone call from big daughter to let us know that her lecture had finished and she was waiting for us. 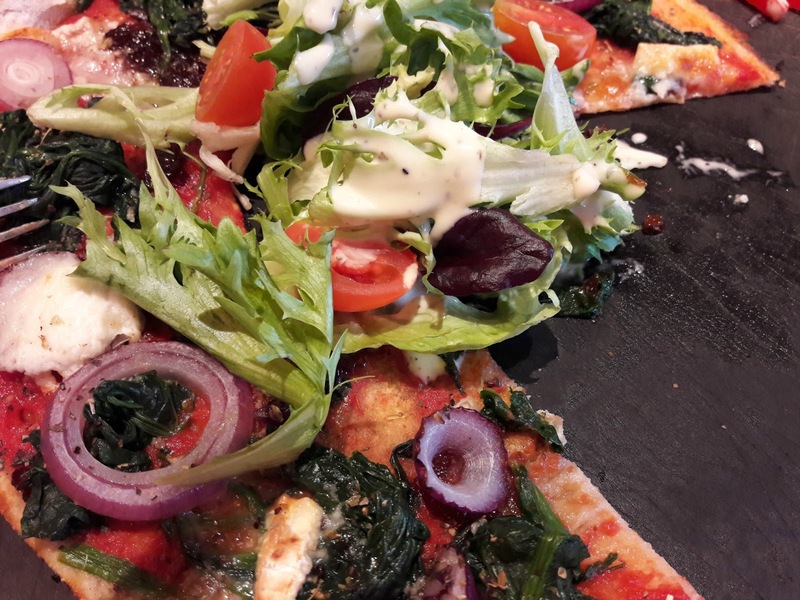 Pizza Express for lunch - small daughter's choice (her half-term holiday, she gets to choose, apparently). Did you need to see a picture of my pizza? Probably not, but it was good so a photo is the only sharing that I did with it J. Storm Doris hit us yesterday and we decided to stay indoors. Given that trees were blowing over in the village and the rain was battering incessantly against the windows for most of the day, even the dog decided that he could do without a walk and instead spent the day snoring in his favourite spot in front of the Aga. We were lucky to escape without any damage although I know that hasn't been the case elsewhere, and if the storm hit where you were then I hope everything is all right and you stayed safe. It was all calm again this morning and the roads were very quiet as I drove small daughter and her friend to the pictures. This time, we watched Trolls. There were lots of singing Trolls and I was pretty sure that time started to go backwards at one point, although small daughter and her friend loved it. And it really would be quite nifty to be able to pooff glitter out of your bottom at will as one of the Trolls could. It was a good job I took my knitting. 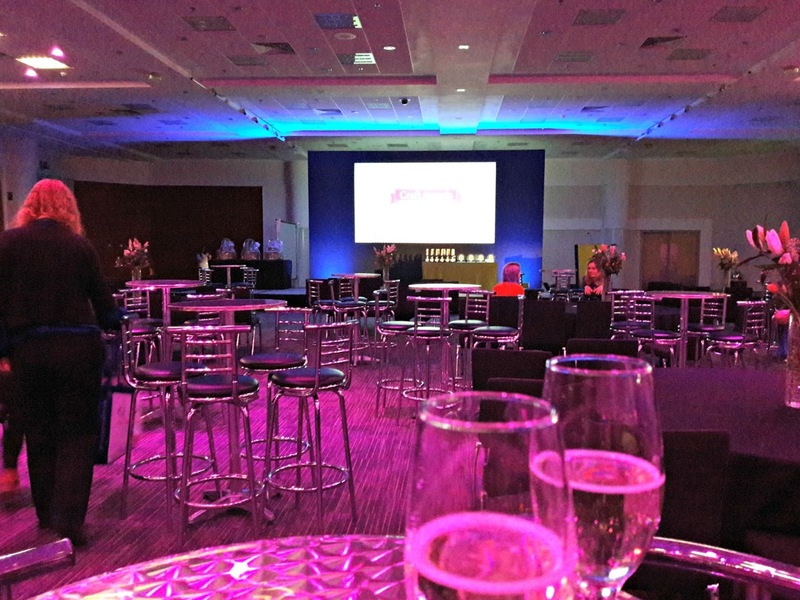 Do you fancy coming to an awards ceremony? 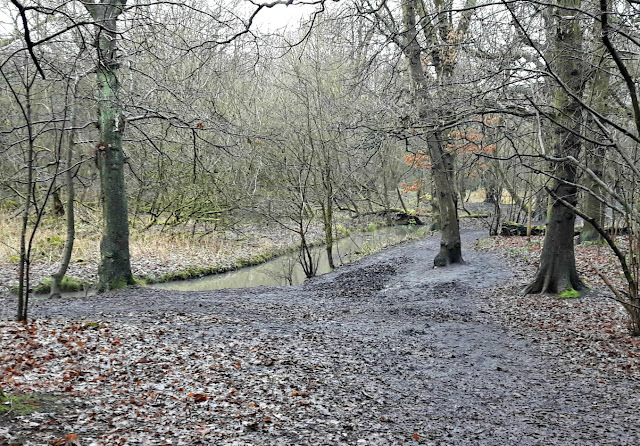 Come on then, grab your coat and jump in the car - we're heading to the NEC exhibition centre at Birmingham so it's a bit of a journey (about an hour and a half from Winwick) but big daughter has the wheel so we can chat while she drives. We're off to the British Craft Awards, now in it's 19th year, which recognises people and companies from five crafting areas - sewing, quilting, papercraft, cross stitch and knitting & crochet. 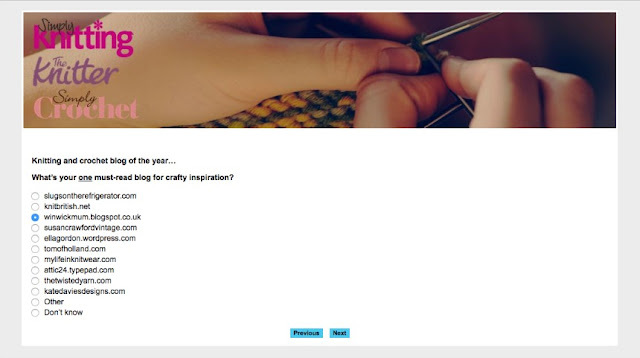 I've been nominated in the Knitting and Crochet Blog of the Year category and I'm super-proud to see my blog listed there with all of these other fabulous entries. 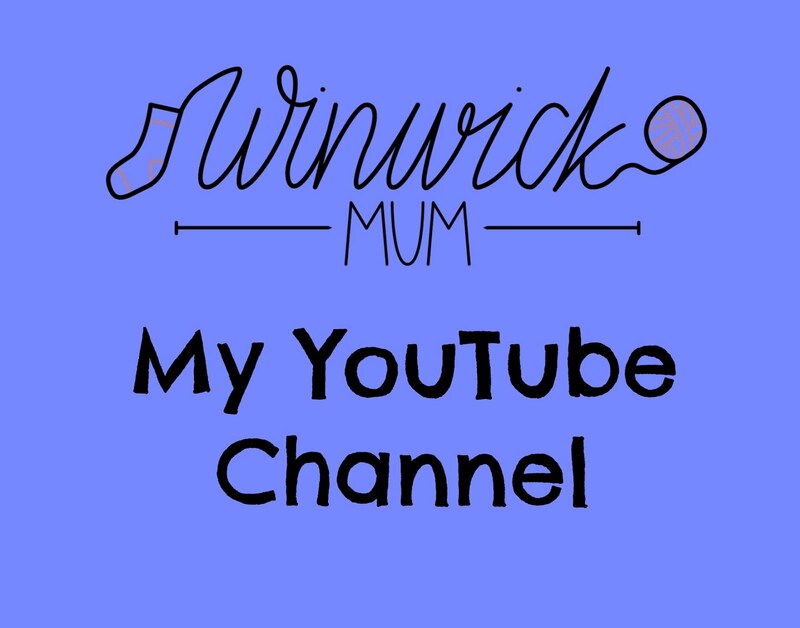 I've been writing as Winwick Mum for nearly 7 years now, although I've only been writing the blog as it is now for the last 3 and a half, and to see my blog listed with these other people after such a relatively short time is quite incredible. We've arrived, we've parked, we've stretched the stiffness away after being slowed down by roadworks on the M6, and now we've found the room where the awards are to be presented. 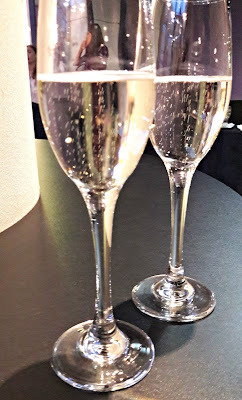 Despite our delays, we're a bit early so there's time to pick up a glass of fizz (it's OK, I'll be driving home so you can have a drink if you want to or there's juice if you'd prefer) and find our seat before it gets too busy. Have you ever been in an empty car park and not known where to park because of the choice? We're a bit like that here - but it also means that we get to choose the best seat so here we are directly in front of the main screen and also with a good view of the doorway so that we can see everybody coming in. 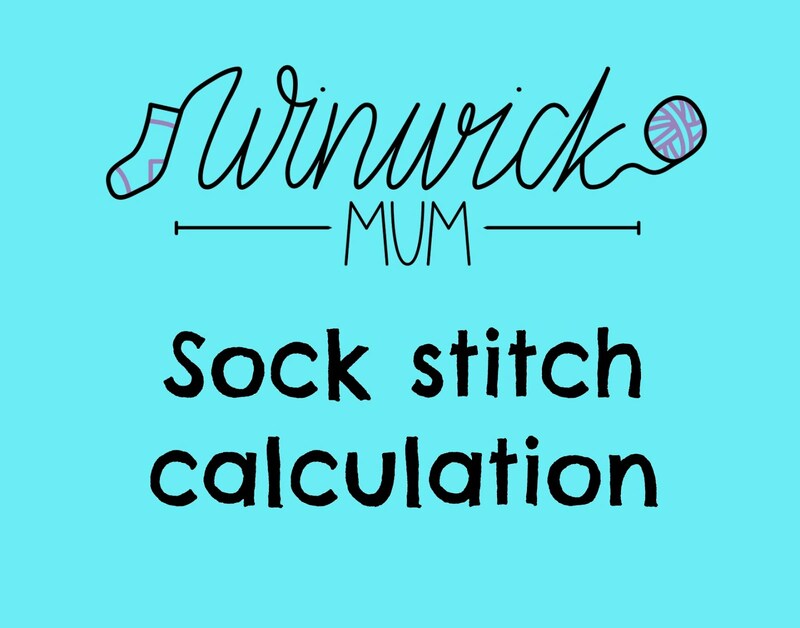 This presentation is being held after the close of business at the Stitches trade show, so there are people from all disciplines of the crafting industry, from scrapbooking to knitwear design, who will be coming along. It's a bit busier now! 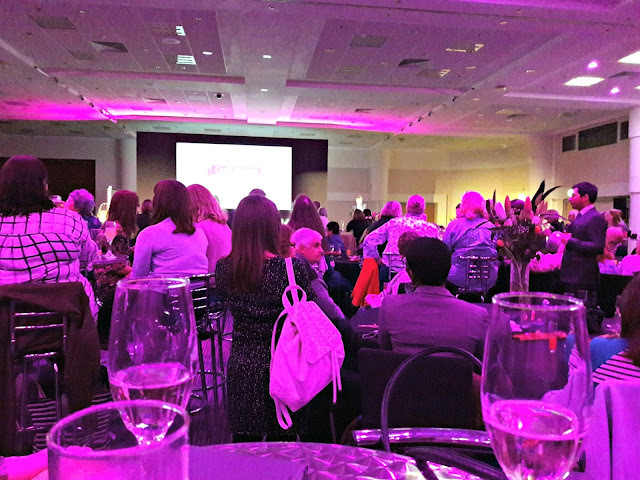 There's a short speech by Andy Marshall who's the Group Managing Director of Immediate Media (in knitting and crochet alone they have 17 different brands so this is a huge company!) and then a quick talk about their new TV channel, Sewing Quarter. We're sitting with Juliet Bernard (I did a continental knitting workshop with her last year) - she's lovely, I knew you'd like her - and we've also chatted to Debora Bradley who's the editor of The Knitter magazine, Sara from my local yarn shop Black Sheep Wools, the folks from Wool Warehouse and West Yorkshire Spinners and Kirstie McLeod who's the editor of Simply Knitting magazine. 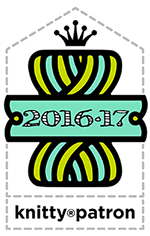 It feel amazing to be part of this group of people whose lives revolve around yarn much as mine does these days. You can learn so much just from being here and being involved, and I wonder if you're feeling quite as giddy as I am even before the presentations start! The awards are being presented by the hosts of Sewing Quarter, John Scott and Natasha McCarty and once the presentations do start, it all moves along quite quickly and you have to listen hard or you'll miss something. Did you see me nearly fall off my chair when they announced the winners of the Blog of the Year? I was so busy waiting to cheer for whoever won that I didn't expect my name to be called - I came second! Oh my life! How exciting is that? I'm so proud to have heard my name called out, and very grateful to everyone who voted for me to be there! Thank you! My lovely friend Lucy won the category and it was such a shame that she couldn't be there with us because of other commitments to collect her award (there was just one for the winner if you're wondering why I've not shown you a photo - I'll leave Lucy to show you her award herself). You can hold it in the car on the way home as we're taking it back with us to save it being posted because it's glass and it'll be safer to hand it over in person, but you must promise not to drink her bottle of champagne! 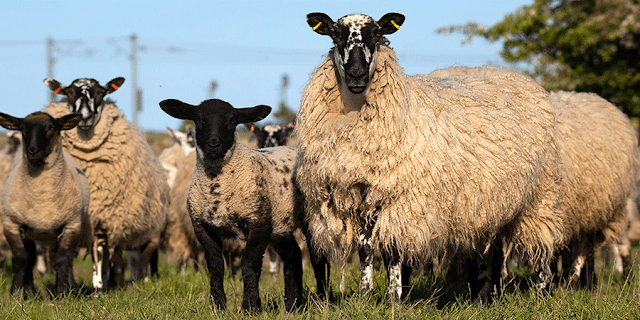 We're just going to say hello to a few more people before heading back to the car park. The whole event has passed so quickly but it was great fun and I've loved every minute of it. How about you? Don't drop that award you're holding now, will you? 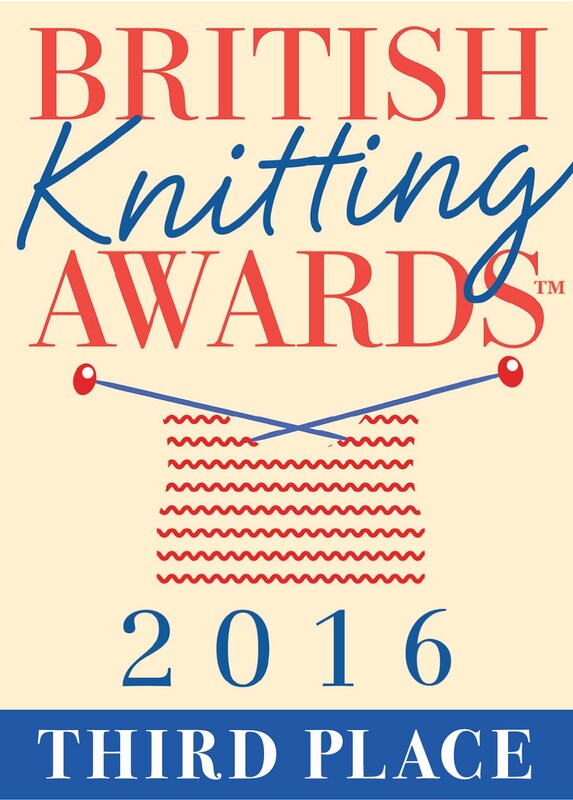 You can read about the other winners of the Knitting & Crochet category here. Congratulations to everyone involved in the awards! After that title, you might have been hoping for a post about tall grey birds wearing hand-knits, in which case I'm sorry to disappoint you. There are herons and socks in this post - but not both at the same time! We had a rare moment this morning ... the sun shone! Not for long, and by the time I had got my camera out to photograph this miraculous event, it had gone. Ah well. I've reached that point now where if it's not going to snow, then Spring might as well hurry up and get here - I'm bored with dismal damp days now! What else have I learnt this week? 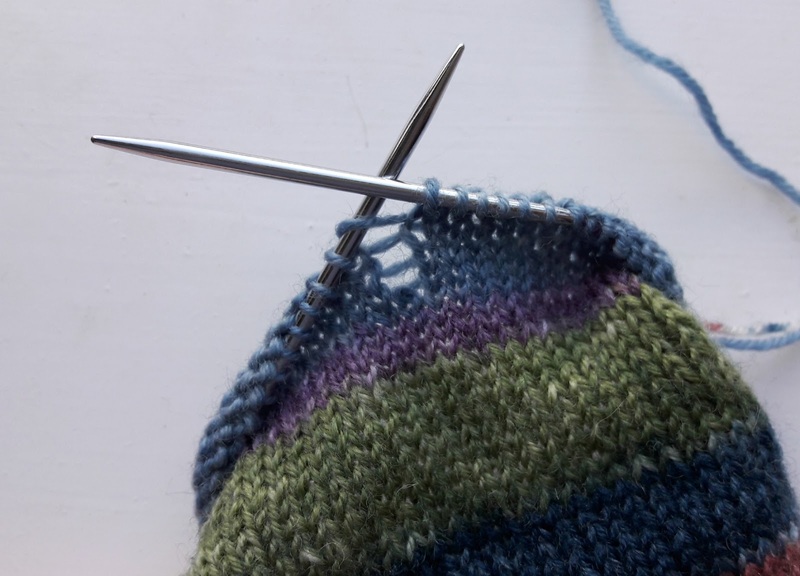 I have learnt that there are a fair few Easy Cable Socks on needles and feet out in the big wide world. How lovely is that? 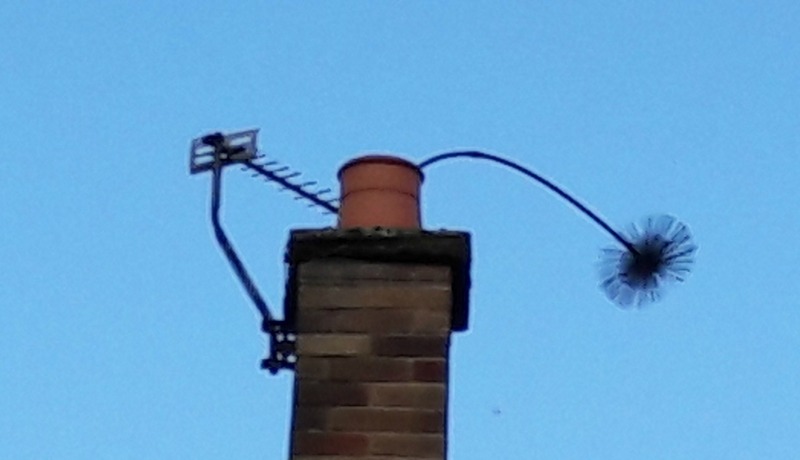 It does make me very happy to see that my pattern has helped people to tackle cables, and I thought you might like to see a few pictures. 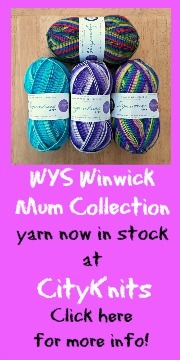 Lots of different colours, lots of different yarns, but they all look beautiful. 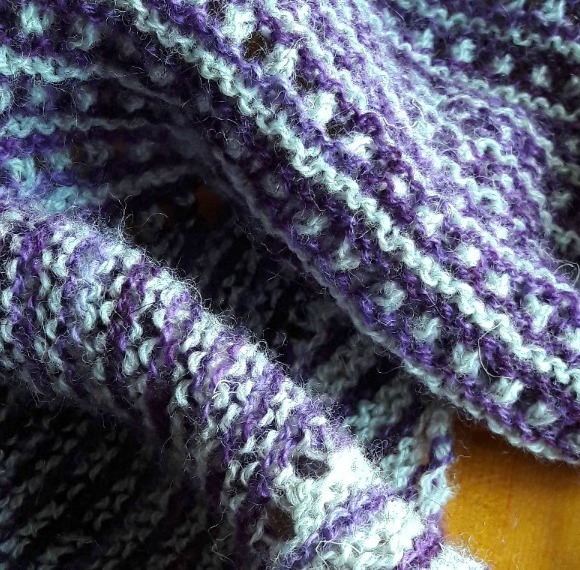 Cables work so well with so many different yarns - the only time that I've found it doesn't work so well is with a complicated cable pattern and a very vibrant yarn; the cables get lost in the colours which is always a shame after the effort involved. 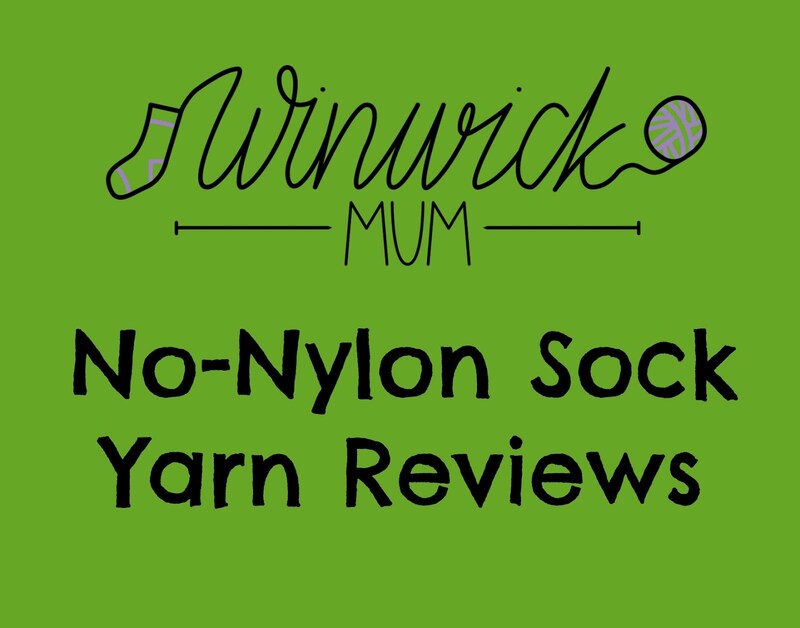 I'm sure you'll agree that these yarns are just right, though! 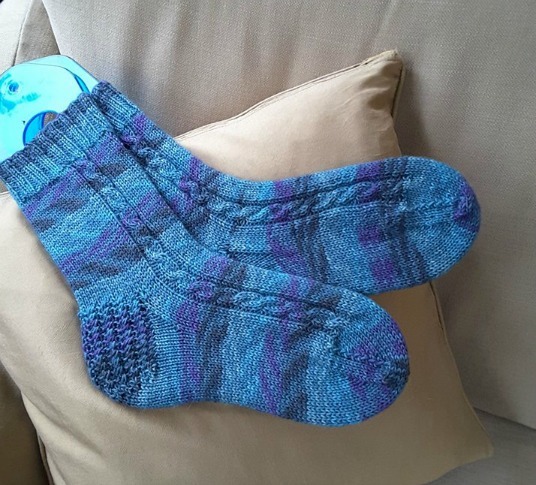 These are Christine's socks (not me, another Christine J) and I really like the way her cables look in this stripy yarn. 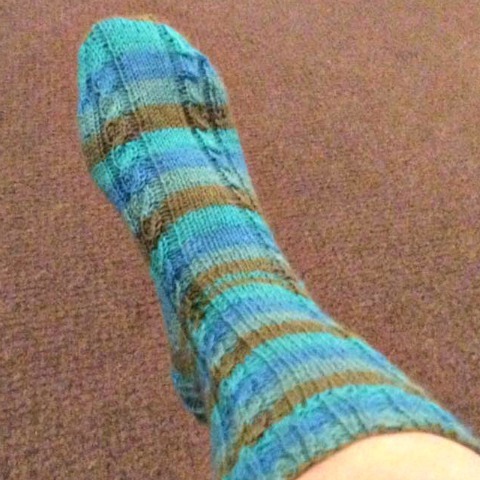 She's used Drops Fabel and has managed to match her socks beautifully, which isn't always easy with this yarn. 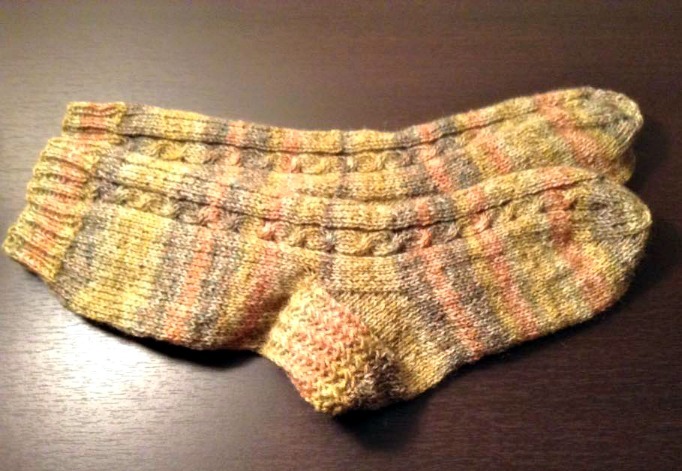 Ellen has also knitted a stripy pair, using Sirdar Heart & Sole shade 0055. The cables don't break up striped yarns but they add a nice texture to them. These colours aren't so bright that the cables have got lost, either, which is great. This is my lovely friend Lucy's sock. 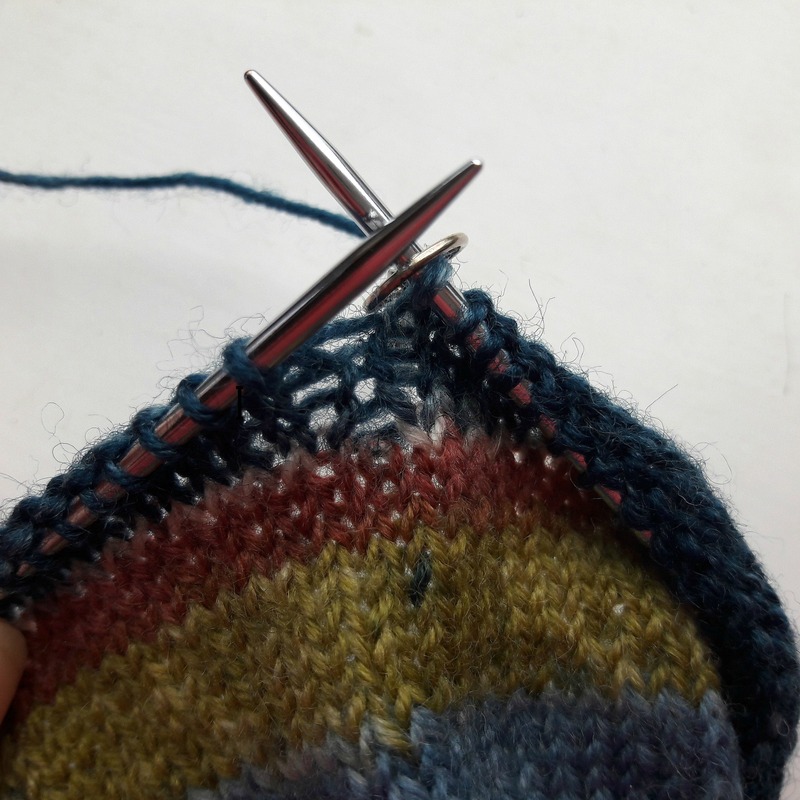 Do you know, I never thought that the Blanket Guru would ever find herself knitting socks, and I'm very flattered that she chose my Sockalong pattern to use when she decided to pick up the pointy sticks. 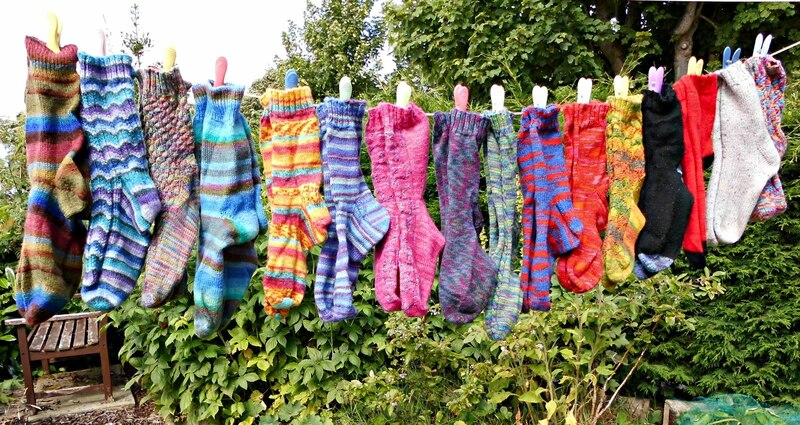 More than that, Lucy's turned into quite a prolific sock knitter and now she's onto cables too ... is there no end to her talents? By the way, this yarn is Stylecraft Head Over Heels in shade Eiger. 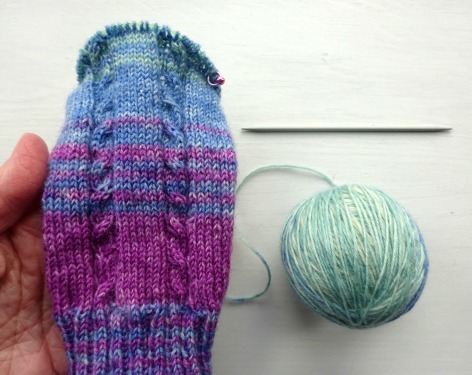 These stripes are much softer than the Heart & Sole and the colours are just gorgeous. 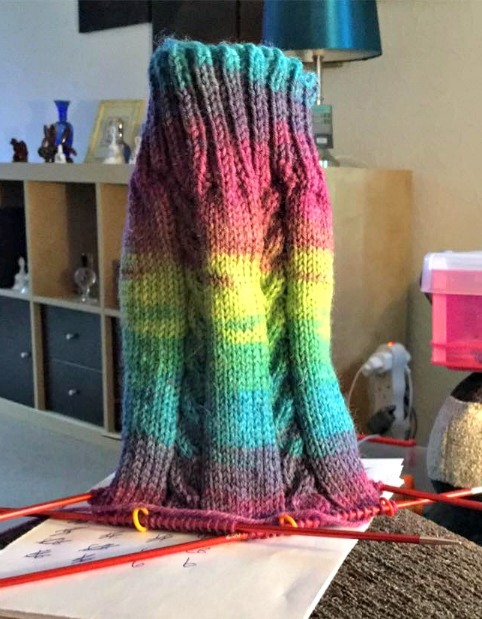 What do you think about this rainbow sock? The yarn is Opal Surprise, and I think Margaret's made a great choice. The stripes are much less formal in this yarn and I really like the way the colours blend into each other down the cables. Another stripy yarn - this one in shades of blue. 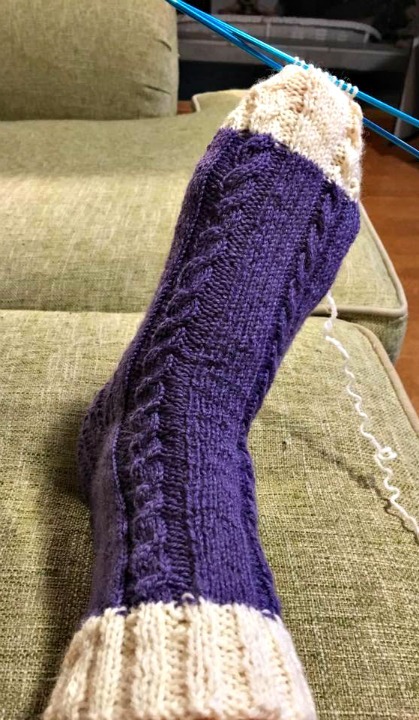 The cables still stand out really well, and I think the crossed rib stitch heel looks great! Susan has made such a good job of these, and they look fabulous on the blockers. This yarn is Regia Blitz Color shade Lagune 2526, although sadly it's been discontinued. I love it when you show me your socks! 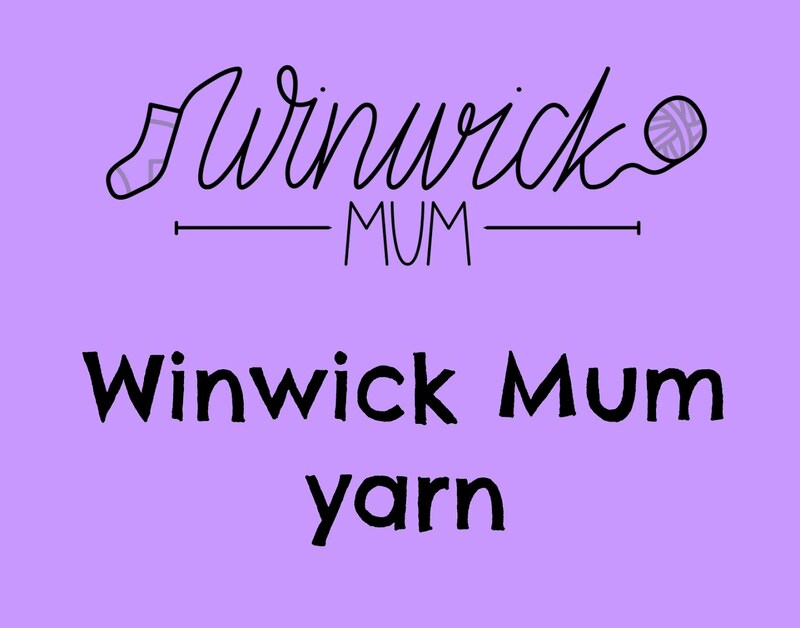 Don't forget that you can link them to the project page on Ravelry too, which is also really helpful if someone else is trying to decide whether a pattern is for them or not - your photos might make all the difference! 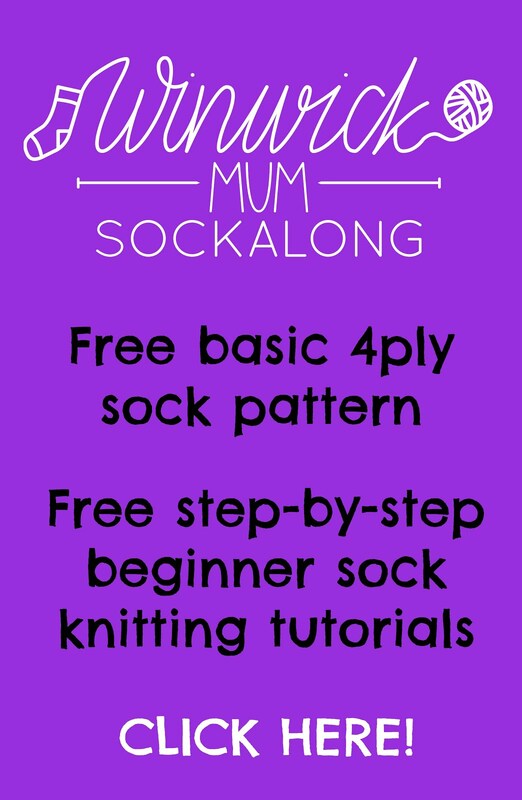 If you've been inspired to give these socks a go, you can find the pattern here, and don't forget that there are videos to go with this tutorial as well. 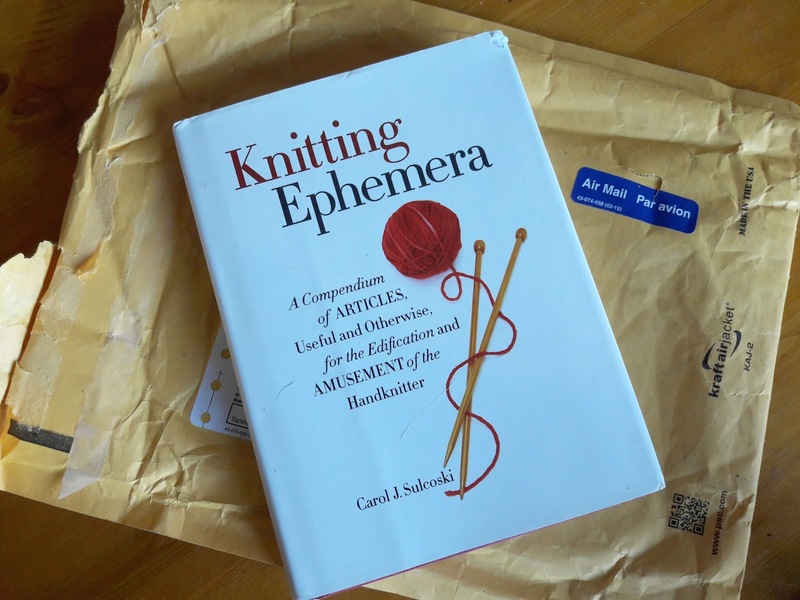 In more sock-related excitement, these needles arrived in the post today. 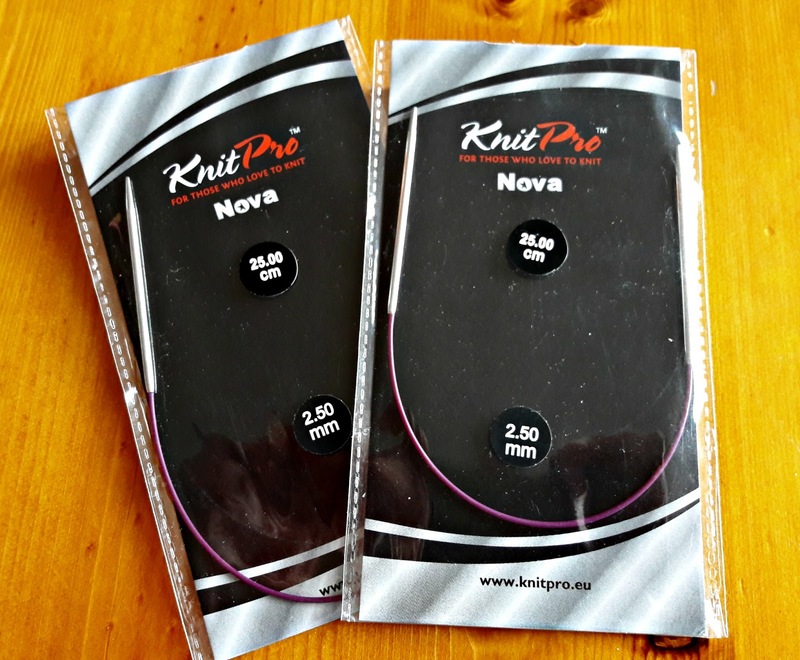 They're KnitPro 25cm sock needles, but (and here's the exciting bit) they have metal tips. I never knew they existed! I already use KnitPro 25cm needles for socks with a smaller number of cast on stitches than 60 (it gets too tight to be comfortable on a 30cm needle) but up until a couple of days ago I thought they were only available in the wooden Symphonie range. They're very pretty with their coloured wooden tips, but I prefer the weight of metal needles so I was delighted to spot these on a post on Instagram (I love Instagram, but it's costing me a fortune when I keep spotting things!). I'm going to knit some smaller pairs of socks this year (small daughter's feet aren't quite as big as mine yet although she's growing like a weed so it won't be long), so I'll be able to use these instead of the wooden ones and see how they compare. 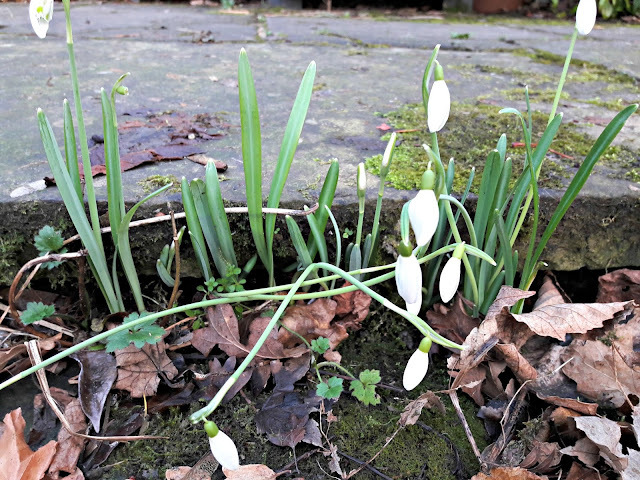 I was going to show you some pictures of the garden - there are signs of Spring appearing now - but I'll save those for another day. 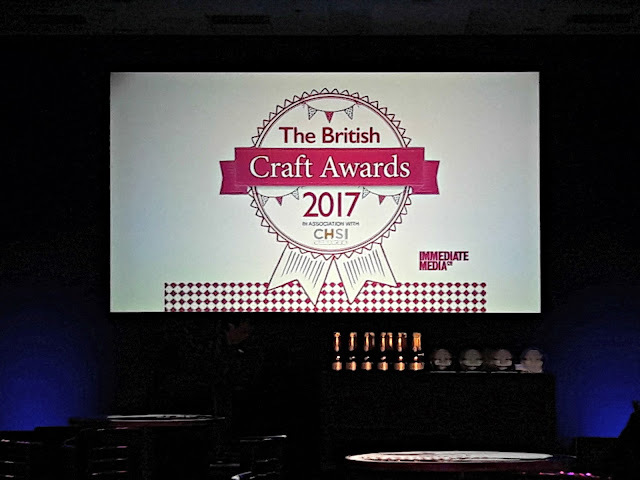 My final bit of news to tell you is that I'm going to the British Craft Awards presentation on Sunday - if you remember from this post in December I've been shortlisted in the Knitting and Crochet Blog of the Year category along with some real stars of the knitting and crochet world - Kat Goldin, Louise Scollay of KnitBritish, Susan Crawford, Ella Gordon, Tom of Holland, Rachel Atkinson (Daughter of a Shepherd), Lucy Attic24, Phil Saul of The Twisted Yarn and Kate Davies - and I'm not going to miss the opportunity to rub shoulders with some of these people! 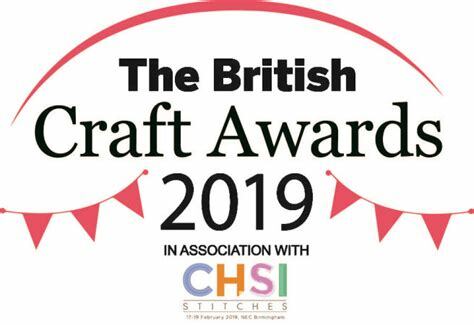 Thank you so much if you voted for me in the awards - quite honestly, I consider that just being able to go is winning enough so I'm very happy to be invited, and I'll be sure to tell you all about it next week. Anyway, here we are the in the middle of the week and what have I got to tell you? 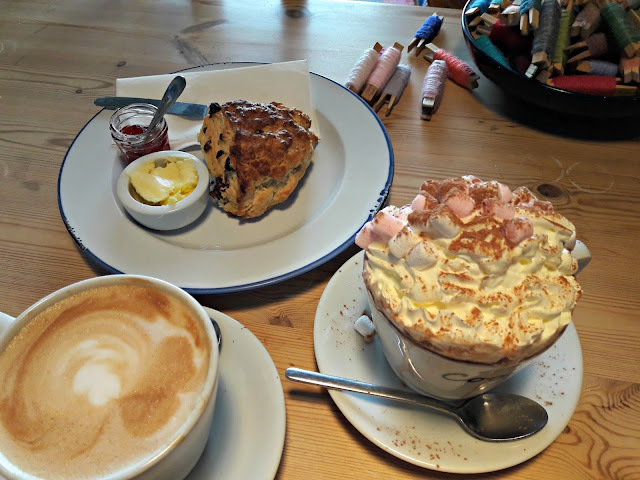 Well, I had a day out to see my friend Lucy yesterday and no trip to Coopers Cafe Bar in Skipton is complete without one of their "fully loaded" hot chocolates. Ooh, I can't tell you how much I enjoyed that mug of calorie-laden, marshmallow-and-chocolate-covered sweetness! The scone that we shared was warm from the oven too ... mmm! Big daughter and I went to have a look at some student flats this afternoon - she needs to make her choice for next year already. I was very pleased to be asked to go with her as I know that she's old enough to do these things without her Mum in tow if she chose to. She's already seen quite a few places that didn't meet her expectations but today's viewing seemed to go very well so I think she may have discovered what she was looking for! 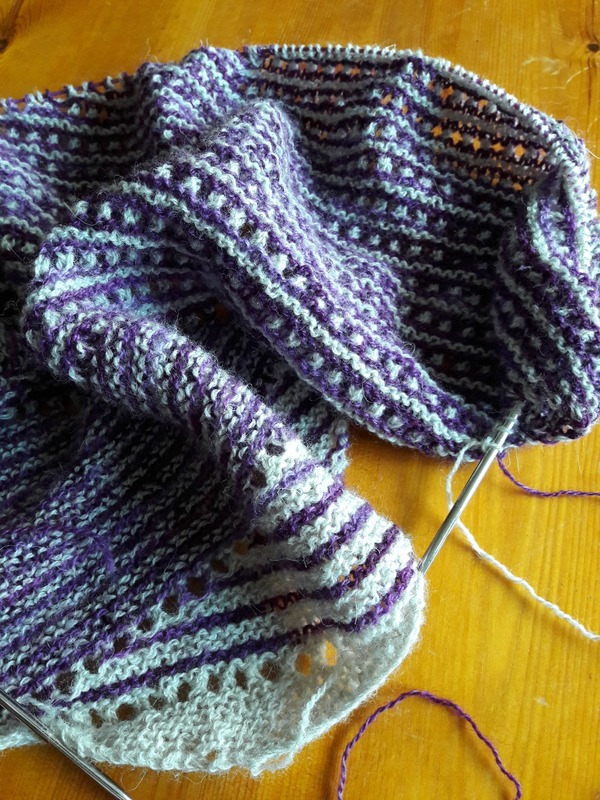 A few days have passed and my Hartland Cliffs shawl and I have made friends again. In fact, I'm steaming ahead now that I've read the pattern properly, and I've nearly caught up to where I was when I realised it had all gone horribly wrong. I'm really enjoying knitting with this yarn - it's Blacker Yarns St Kilda Laceweight - and it's lovely and springy and not at all bothered by the fact that I've had to frog a huge amount of the knitting. 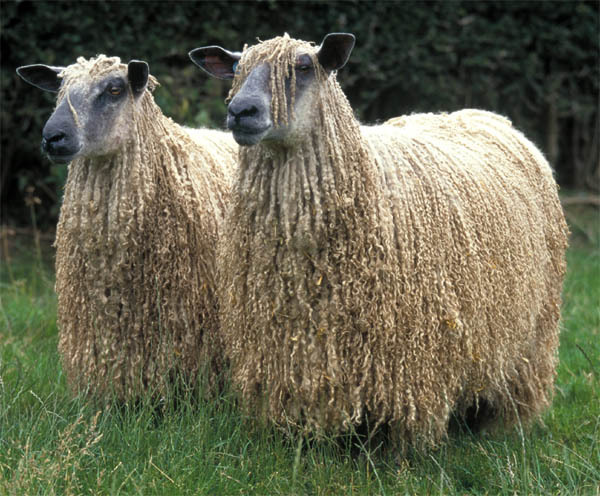 You can see the woolly fuzziness (I think the technical term is "halo"!) of the yarn in this picture, and I can't wait to wrap myself up in this shawl. It's not feeling itchy at all whilst I'm knitting it, despite the fact that it's 100% wool. It's been a long time since I've knitted a laceweight shawl - over three years ago, in fact - and I'd forgotten that you have to do a lot of knitting to make it look like you've done anything much at all, but I know that it will be worth it in the end. 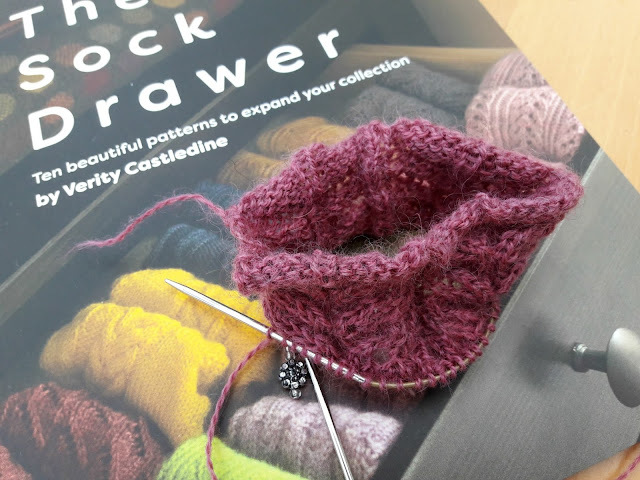 The finish date for the Blacker Pod KAL is 4 March, just before the Edinburgh Yarn Festival, so I've got some knitting to do if I'm going to finish this and my socks before then, although the world won't stop if I don't - I've learnt a lesson or two about deadlines after the Easy Cable Sock tutorial! 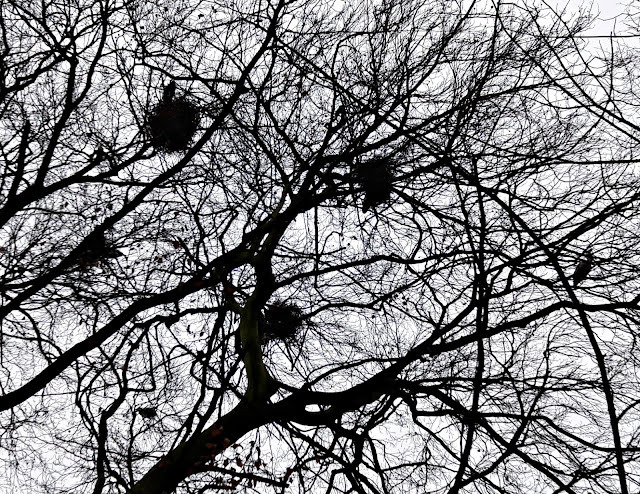 Finally, before I leave you to enjoy the rest of your week, I've got some very exciting news! 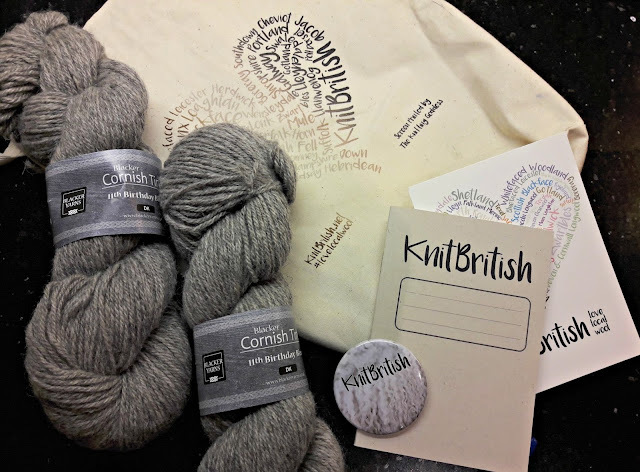 On Friday morning I was lucky enough to get a Woolly Muckers package from KnitBritish - only 10 of them were available and it was a case of the fastest fingers when they went on sale. Luckily, I have had years of practice at fastest fingers thanks to trying to buy concert tickets to bands that big daughter wanted to see when she wasn't old enough to go on her own, and this training stood me in good stead at 11am on Friday morning. So what is it? I hear you ask. 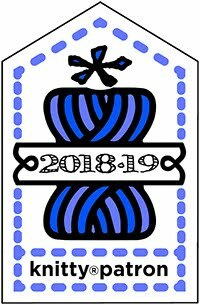 Well, I mentioned KnitBritish in my last post when I was talking about podcasts; KnitBritish is one of the few podcasts that I will make sure I have time for, and Woolly Muckers is the way that Louise, who records the KnitBritish podcast, has decided to support her work. The 10 Woolly Muckers packages contained a project bag designed exclusively for this project by The Knitting Goddess, a pen, badge and notebook (always handy!) and two skeins of Blacker Yarns Cornish Tin II DK in Levant Grey (yet more Blacker Yarns yarn in my stash - hooray!). These are certainly lovely treats, however what really drew me to the Woolly Muckers package is that buying it means that I am now going to be sponsoring an episode of the podcast. 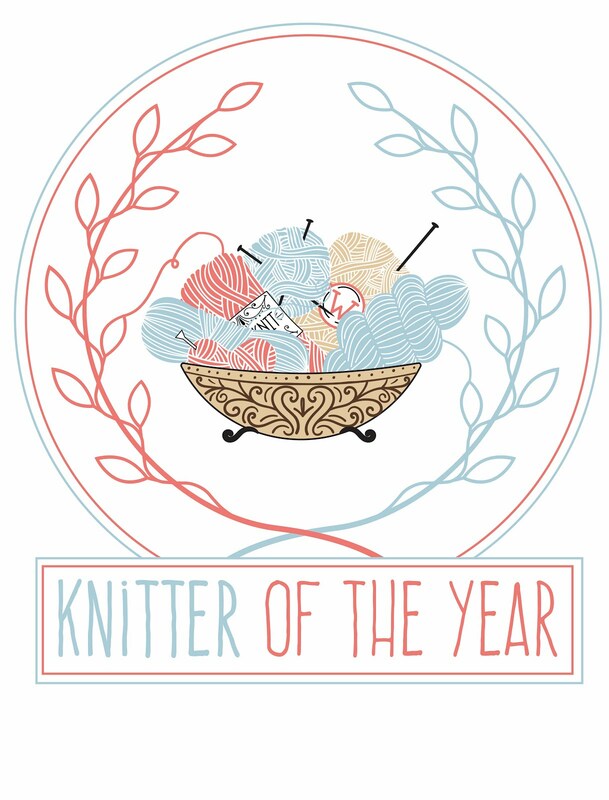 I'm really thrilled about this as KnitBritish and Louise's contributions to other websites such as Wovember have been really helpful with my search for British breeds and no-nylon sock yarns and quite honestly, I'd have sponsored the show without all the treats just as an opportunity to return the favour. 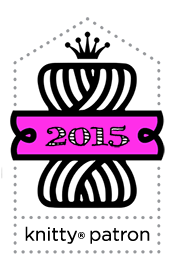 I don't know which episode of this year's podcasts I'll be sponsoring just yet, but I'll let you know when I do! Enjoy the rest of your week; apparently Thursday is now the unofficial start of the weekend so it's all downhill from here - in the best possible way, of course!